Learn all there is to know about these coin groups, and how each Gold American Eagle Proof 70 coin has performed every year since their initial 1986 launch. Investment Grade Coins, on the other hand, are coins minted by the U.S. Mint or other world mints that have shown a track record of investment performance that exceeds that of bullion and even other rare or semi-rare coins. Investment Grade Coins don't trade on an index and therefore have a value that tends to be much less volatile than bullion. This is the key factor that makes these coins ideal for investors who want to shelter and protect their assets from the risks of the commodities and equities markets. Unlike with bullion, the price of Investment Grade Coins is not subject to manipulation by world banks, the Fed, or other political forces. Instead, the value is wholly determined by supply and investor demand, just like prime real estate and other highly sought after tangible assets. Watch this short video to learn more about the U.S. Gold Bureau and our goal to help our clients understand the importance of diversifying within precious metals. Gold Eagle Proofs that have been independently tested and certified in "museum quality" condition are considered "Investment Grade Coins" due to their rarity and premium value over the standard issue coins. As such, their value is not directly tied to the fluctuations in the market price of gold (also known as the "spot price"). Due to ever-increasing demand and a fixed supply, the value for these coins is more stable over time and the investment performance for many of these coins has out-paced gold bullion for many years. That's why the U.S. Gold Bureau recommends Investment Grade Coins as a long-term store of value, helping to protect your financial portfolio from dips in the bullion market and turbulent economic times like we are experiencing now, while setting you up for the possibility of long-term protection and growth. Investors select these coins for their rarity and market demand, which can help to preserve their value, even when the commodities market fluctuates. The value and price of these coins is driven by their rarity, tracked as the "Proof 70 population," which indicates how many of these coins are in existence in the world. The lower the population, the higher the value tends to be. Serious investors work to assemble deep portfolios of these coins, accumulating a coin set from each year of mintage, plus multiple sets of the most prized years, when possible. These sets are acquired by our company through estate sales, private auctions, seized bank vaults, buy-backs from past clients, national coin shows, and through the national rare coin dealer network. Clients of our Private Client Services Division have the first opportunity to acquire these sets before they are made available to the general public. The U.S. Gold Bureau has partnered with former Director of the U.S. Mint, Ed Moy, to offer hand-signed certification labels on America's #1 Investment Grade Coin, the Gold American Eagle Proof 70 coin. The Ed Moy Signature Series of Gold American Eagle Proof 70 coins will be highly sought after by investors and collectors and is exclusive to the U.S. Gold Bureau, meaning population for Proof 70 coins and Date Runs will be extremely low, adding to their investment potential. In addition to being the 38th Director of the United States Mint, Edmund C. Moy is a well-known author, economist and public speaker. He served as Special Assistant to President George W. Bush for over five years and assisted with the transition to the new U.S. Department of Homeland Security after September 11, 2001. The U.S. Mint sold over a $1 billion in numismatic collectibles and struck over 16 billion coins in Moy's first year as Director. During his tenure as leader of the U.S. Mint, the financial crisis, and recession spurred unprecedented demand for gold and silver bullion. The 50 State Quarter program, the Presidential $1 Coin, and the National Parks Quarter program were also milestones of Ed Moy's term with the U.S. Mint. Ed Moy Signature Series Gold American Eagle Proof 70 are available as single coins, 4-coin sets, and even a full Date Run featuring one of each Gold American Eagles minted since 1986. Demand for these hand-signed coins is expected to outpace supply as investors and collectors realize the tremendous investment potential of these coins. Please contact us for more information about this incredible opportunity available exclusively through the U.S. Gold Bureau. 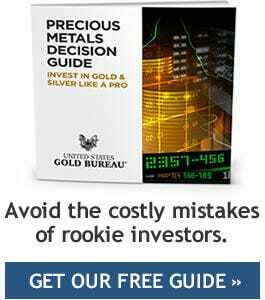 Gold American Ealge Proof or Bullion? In addition to pricing and market variation differences, the production process for bullion and proof coins differ, as well. Proof coin production is a highly specialized process, and as a result, is labor intensive and requires a high degree of precision and oversight. Un-struck polished coin blanks are fed by hand into a coin press, where the blank will undergo several rounds of striking. The highly sharp and detailed images seen on Proof coins, particularly those earning the highest quality scores, are a result of these multiple rounds of strikings each coin undergoes. The more in-depth proof production process also results in coins that have the characteristically high-sheen background and overall pristine appearances. Another way the value of your Investment Grade Proof coin can be solidified is by a quality score, or grade, as issued by an industry authority like the Numismatic Guaranty Corporation (NGC) or Professional Coin Grading Service (PCGS). While both bullion and Proof coins can receive grades that, in turn, indicate respective quality levels, grading for Proof coins helps bolster the value of Proof coins, whereas, with bullion, the value is derived from market factors and commodities prices. NGC and PCGS rely on what is known as the Sheldon Scale when grading precious metal pieces. The Sheldon Scale, which was established in 1949 by William Herbert Sheldon and updated in the 1970s, denotes coin qualities via a rubric ranging from scores of one, which indicates poor quality, to 70, which indicates “perfect” quality. Only a small percentage of Proof coins ever receive the highest-level PF70 grade. Proof coins obtained directly from the U.S. Mint do not come graded, and additional steps must be taken by the coin holder to get such a score. 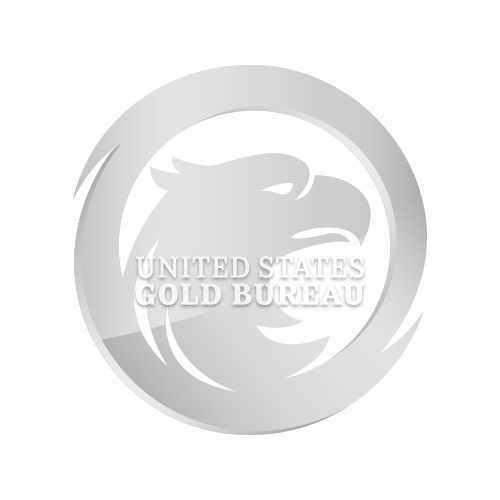 In step with our mission to provide clients with the highest quality products and most streamlined path to precious metals investing, the United States Gold Bureau is proud to eliminate the need for our clients to obtain grades on their own, a process that can be difficult and resource intensive. We offer a Proof coin inventory made up almost exclusively the highest PF70 pieces, pre-graded for you! In December 1985, the first year of his second presidential term, Ronald Reagan signed the Gold Bullion Act of 1985, officially authorizing the newly conceived Gold American Eagle coin. The coin would be released for the first time by the U.S. Mint the following year. As the official gold bullion coin of the United States, the U.S. Mint issues a standard “Business Strike” version, intended for general bullion circulation, and a much smaller number of investment-grade Proof coins that are geared toward precious metals investors each year. In 1986, the coin’s first year in circulation, only a one-ounce version was released, followed by both one-ounce and half-ounce versions in 1987. Each year since, the Mint has released these initial one and half-ounce sizes, in addition to quarter-ounce and one-tenth-ounce variations. Although not necessarily reflective or the coins’ realized values, each size boasts a respective face value: $50 for the one-ounce coin, $25 for the half-ounce, $10 for the quarter-ounce and $5 for the one-tenth-ounce version. Gold American Eagles in all four denominations are legal tender and guaranteed by the U.S. government to contain the amount of gold in troy ounces as indicated in their inscriptions. Pursuant to the Gold Bullion Act of 1985, and undoubtedly contributing significantly to the coins’ popularity, Gold American Eagles must be struck of gold mined in the United States, making it a truly American coin. Additionally, the coins are alloyed with silver and copper to produce a durable investment piece more resilient and resistant to commonplace wear and tear than purely gold pieces. The resulting 22-karat gold composition, or 91.67% pure gold, is the English standard traditionally dubbed “crown gold.” Crown gold alloys had not been used in United States coinage since 1834, making the Gold American Eagle’s inaugural run the first time in 150 years the standard was employed. Although Gold American Eagles as we know them today came about toward the end of the 20th century, the term “eagle” dates back to the pre-1933 era of American coinage, when the country – and the world – was still on the gold standard. Beginning in 1792 when American coinage was officially instituted by the Coinage Act of that year, the term “eagle” was a standard unit of money representing ten U.S. dollars ($10). Along with this initial $10 base unit came smaller eagle derivatives of $5 – the "half-eagle" – $2.50 – the "quarter-eagle" – and eventually, in 1849, the higher-valued "double eagle," which represented USD 20. The Coinage Act of 1792 was the first time coinage in the U.S. was regulated and made uniform at the federal level. It was a landmark piece of legislation that, in addition to instituting American currency and creating a national Mint, established the dollar as the nation's standard unit of money. This initial act would be followed up by several subsequent coinage acts, each leaving their unique mark on the monetary system of the United States. The Pre-1933 Eagle was produced and circulated in coin form from 1792 to 1933 and brought about some of the country’s most notable and highly revered currency designs. Perhaps the most famous numismatic work of art born out of the Gold American Eagle series is the beloved Augustus Saint-Gaudens’ double eagle design. Early-20th century Eagles were discontinued in 1933 when then-President Franklin Delano Roosevelt signed Executive Order 6102 “forbidding the Hoarding of gold coin, gold bullion, and gold certificates within the continental United States.” The order was intended to curb the noted “hoarding” that was presumably fallout from the economic strain and general hardship inflicted by the Great Depression. The following year, Congress passed the Gold Reserve Act, which stripped gold coins of their legal tender status and halted the circulation and private possession of American gold coins altogether (although collector coins remained exempt from the stipulations). The newly issued legislation led to none of the more than 445,000 1933 double eagles that had already been struck ever being circulated. Instead, under the mandates, all but two of the coins were ordered to be melted down. The two spared from destruction were presented for preservation to the U.S. National Numismatic Collection by the Mint, where they remain to this day. In the years following the 1933 acts, it came to light that more than the two officially preserved double eagles were spared from melting. Secret Service Investigations made it clear that at least 20 double eagles had been stolen from the Mint and distributed into the hands of investors and collectors unlawfully. Nine of the stolen coins were recovered by authorities and subsequently melted down, with the other 11 remaining in existence to this day. With only these 13 coins known to be still intact, the 1933 gold double eagle is one of the rarest coins in the world today. Late-20th century Gold American Eagles are undoubtedly the most popular coin produced by the United States, typically enjoying impressive values and serving as reliable stores of value for investors. With new releases issued each year, the opportunity for investing in this hallmark American piece is ongoing, providing a perpetual draw for precious metals enthusiasts and investors alike. Since its initial release in the late-1980s, the Gold American Eagle has soared to the top of global investment markets, making it one of the most prized precious metals pieces on the present-day world stage. In addition to establishing the coin itself, the Gold Bullion Act of 1985 also dictated some basic design requirements for the $50 piece. According to the law, the largest of the four denominations must boast a design “symbolic of Liberty” on its obverse, and on its reverse, must include a depiction of “a family of eagles, with the male carrying an olive branch and flying above a nest containing a female eagle and hatchlings.” In addition, the coin must bear inscriptions of its $50 face value, its gold contents in troy-ounce weight, the year of issue and the words that have become almost synonymous with American money: “Liberty,” “In God We Trust,” “United States of America,” and “E Pluribus Unum.” Finally, the Gold American Eagle must be struck with reeded edges. The obverse of the late-20th century Gold American Eagles recalls what many deem the most beautiful coin design in United States history. The piece boasts a replica of August Saint-Gaudens original pre-1933 double eagle depiction of a glorious Lady Liberty striding forward, holding a torch in one hand and an olive branch in the other. Liberty’s hair and dress flow elegantly around her as beaming rays of sun peak over the horizon in the background. The United States Capitol building can also be seen in the background. The entire image is surrounded by a perimeter of shining stars while the word, “Liberty” and year-of-issue line the top edge and right side of Liberty, respectively. While today, Saint-Gaudens’ double eagle imagery is considered one of American coinage’s most brilliant artistic achievements, the story of the design’s inception is not without turbulence. In 1904, then-President Theodore Roosevelt embarked on a personal mission to “beautify” American coinage after deeming it in a state of artistic “hideousness.” It is documented that Roosevelt did not want to involve Congress in the redesign project and hoped to appoint an artist of his choosing to carry out the work. As such, American sculptor and personal friend of the President, Augustus Saint-Gaudens, was commissioned to rework the five coins that could be redesigned without Congressional legislation. The commissioning of Saint-Gaudens would mark the first time in U.S. history that someone other than a Mint employee designed a federal coin. After doing some brainstorming and researching of his own, Roosevelt proposed to Saint-Gaudens to design the coins in the high-relief style reminiscent of gold coins from Ancient Greece, which the President found to be the most beautiful form of coin. While the Mint’s director at the time, George E. Roberts, noted that “modern coins must be of low relief,” Roosevelt decided he didn’t agree with that conclusion and insisted Saint-Gaudens forge ahead in pursuing the President’s high-relief dreams. The theme of President Roosevelt dismissing well-founded expertise of Mint officials would persist throughout the rest of the redesign process, causing what can be viewed in hindsight as additional challenges. Saint-Gaudens produced several failed attempts at the President’s desired high-relief iteration, including an “Extra High Relief” and slightly lowered “High Relief” versions. These initial iterations proved to be disastrously ill-suited for large-scale production, and as such, only abysmally low mintage figures were able to be achieved (12,000 pieces for the High Relief iteration and a shockingly small output of only 24 pieces of the Extra High Relief coins). Saint-Gaudens' health had been deteriorating for some time now, and while working on the third and hopefully final "Low Relief" double eagle design with his assistant, passed away from cancer in August 1907. Saint-Gaudens' assistant continued with the work the two had started, although he failed to inform the President and other officials involved in the project of the status of the third version. Left in the dark and following several frustrating conversations with the President, Mint staff forged ahead on their own to finalize a low relief version of Saint-Gaudens’ design. The viable iteration was worked on and finished by the Mint’s Engraver, Charles Barber, finally allowing for the strike and release of more than 360,000 issues by the end of 1907. Because of some modifications Barber made to Saint-Gaudens’ original work, his final iteration was denounced by Saint-Gaudens’ family and the artist’s assistant, Henry Hering. Nevertheless, Saint-Gaudens’ $20 double eagle lives on to this day as one of the country’s most revered and beloved coin designs. Following the letter of the Gold Bullion Act of 1985, the reverse of the Gold American Eagle depicts the image of an eagle family. A caretaking male eagle descends upon his family’s nest, where his female mate shelters their hatchling under her wing. “United States of America” lines the top rim of the reverse, while the coin’s troy-ounce weight and denomination line the bottom. The nation’s motto, “E Pluribus Unum” and “In God We Trust” flank the sides of the image, along with the designer’s initials underneath the design. The Gold American Eagle reverse was designed by Miley Busiek and originally appeared on President Ronald Reagan’s inauguration commemorative medallion. For the piece, Busiek took inspiration from Reagan’s acceptance speech at the Republican National Convention in 1980, where the President-elect emphasized national unity in support of the common good. Those words sparked Busiek’s idea to fashion the symbolic American bald eagle not as a lone figure as it was traditionally depicted, but as part of a larger family of eagles working together to support the well-being of their own and future generations. When Congress authorized the minting of gold bullion coins in 1985, Busiek decided to submit her inauguration commemorative coin Family of Eagles design to the Treasury Department for consideration as the image to be struck on the reverse of the newly legalized Gold American Eagle coins. From initial release through 1991, issue years for Gold American Eagles were represented by Roman numerals. Beginning in 1992, six years into the coins’ tenure, the practice shifted to striking years of issue in Arabic numerals. One-ounce Gold American Eagles measure 32.7mm in diameter or just over one inch. As its name would imply, the one-ounce piece rings in at one troy ounce, or slightly over one standard ounce, which is about the equivalent of a standard slice of bread or five U.S. quarters together. The United States Mint - West Point New York. All proofs made at West Point carry the "W" mint mark. Today, Proof Gold American Eagles are struck at the West Point Mint in West Point, New York, which is also home to the U.S. Military Academy at West Point. In fact, all Proof and Uncirculated Bullion American Eagles in gold, silver, platinum, and palladium are minted at West Point, in addition to all gold commemoratives and some silver commemorative coins. The West Point Mint was constructed in 1937, just four years after President Roosevelt ordered all privately-held gold to be turned in to the U.S. government amid the Great Depression. It was initially deemed a bullion depository, primarily storing silver bullion and thus gaining the nickname, “The Fort Knox of Silver.” It wouldn’t become an official branch of the U.S. Mint until 1988, two years after late-20th century Gold American Eagles began circulating. Even so, the West Point facility would come to produce several runs of U.S. coinage over the course of its pre-Mint tenure, with the W mint mark even appearing in 1983, five years before the facility could claim official Mint status. In 2015, after two years of being struck down, the Texas Legislature passed HB 483, a bill that authorized what some viewed as a long overdue bullion depository located in and overseen by the state of Texas. The trailblazing legislation makes the newly approved Texas Bullion Depository the first state-backed gold depository in the country, paving the way to what Texas Governor Greg Abbott describes as the “repatriat[ing]” of gold currently held in New York back to its home state of Texas. In the summer of 2017, the United States Gold Bureau’s parent company, Lone Star Tangible Assets, was selected by the State of Texas to build and operate the newly approved Texas Bullion Depository. The company broke ground on the project in December of 2017 and is slated to wrap up construction of the facility in late 2019. The Texas Bullion Depository ensures a first-class level of services to its clients, offering industry-leading user experience features, world-class technology and encryption, physical security, insurance not provided by other storage facilities such as banks, and state oversight from the Texas Comptroller of Public Accounts. The United States Gold Bureau is committed to creating a streamlined and secure path to investing for our clients and can help facilitate transfers of precious metals into the Texas Bullion Depository. Give our team of Precious Metals Experts a call today to learn more! The Texas Bullion Depository offers precious metal owners a secure way to store precious metals while eliminating counter-party risk. Investors who are interested in using gold as a means of wealth preservation will find that secure storage at the Texas Bullion Depository provides unparalleled accountability, security and stability, ensuring long-term protection of wealth. *Chart is based on historical gold bullion prices as reported by the official Commodities Exchange (COMEX). Gold American Eagle performance is based on the average ask price of all the Investment Grade Proof 70 coins and sets included in the Classic, Modern and Millennium Groups as offered and presented by the U.S. Gold Bureau during the period shown. Line chart represents a 2-month moving average of both figures. The population of the Ed Moy Signature Series coins is a subset of the coin populations thus they will be significantly lower. As with all investments, there is risk and past performance of a particular asset class does not guarantee future performance. USGB, LLC, representatives are not licensed investment advisors. Consult with an independent financial advisor prior to making a decision regarding the purchase or sale of any investment security. Purchases from USGB, LLC, are subject to our Terms & Conditions of Sale, which are available online at www.usgoldbureau.com/faq.